“If necessary,” L. H. Martin wrote in 1897, “I have no doubt that 1,000 men and women, between sixty and ninety, would rise and recite in concert” the lines, “The world is round, and like a ball, seems swinging in the air”—lines from Goodrich’s Peter Parley’s Method of Telling About Geography. Such was Goodrich’s influence on his readers and on a century. 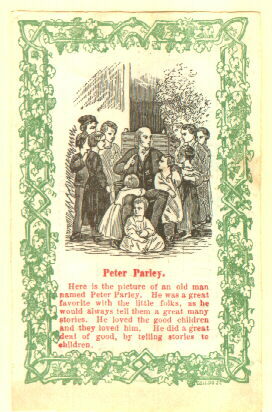 Young readers found his works delightful and loved his most famous creation, Peter Parley—who was the subject of a reward of merit in the 1860s. The founding editor of Parley’s Magazine and of Robert Merry’s Museum, Goodrich also edited or wrote over a hundred books. This list includes biographical pieces and descriptions of his books and of their influence. Reviews of Goodrich’s works are on a separate page. Goodrich is the subject of a wallpaper for your desktop. Mary Arseneau and D. M. R. Bentley. “Peter Parley and the Rossettis.” English Language Notes 31 (1993): 56-60. The influence of Tales About Plants on Dante Gabriel Rossetti. While the authors conclude that the book was indeed by Goodrich, he lists it among the spurious Parley books printed in England. A piece reprinted from Chamber’s Journal holds up Goodrich as an example of “respectable authorship rising above poverty” and includes a description of him and of his house, in the 1840s, in a piece itself reprinted from the Sun. Michael V. Belock. “Suprious Peter Parley Books.” American Book Collector 18 (Summer 1968): 23-24. A brief discussion of Goodrich’s troubles with plagiarists, with a copy of the list of spurious Parleys which Goodrich included in his Recollections of a Lifetime. Goodrich often copyrighted works about which he complained. B. R. Brubaker. “Spoils Appointments of American Writers.” New England Quarterly 48 (1975): 556-564. About the appointment of Goodrich as American Consul in Paris. Rex Burns. Success in America: The Yeoman Dream and the Industrial Evolution. Amherst, Massachusetts: University of Massachusetts Press, 1976. Includes works by Goodrich, including Robert Merry’s Museum. Helen S. Canfield. “Peter Parley.” Horn Book Magazine April 1970: 135-141; June 1970: 274-282; August 1970: 412-418. In a meditative piece on travel, Coane remembers the effect on him of Goodrich’s description of Killarney—and of seeing the actual landscape years afterward. Helen Reeder Cross. “ ‘Peter Parley’—Pied Piper in Print: Samuel Griswold Goodrich, 1793-1860.” New-England Galaxy, 9 #2 (1967): 3-14. F.J. Harvey Darton. “Two New Englands: ‘Peter Parley’ and ‘Felix Summerly’.” Children’s Books in England, 3rd ed. London: Cambridge University Press, 1982. F. J. Harvey Darton. “Peter Parley and the Battle of the Children’s Books.” The Cornhill Magazine Nov. 1932: 542-58. Like almost every American educated after 1827, Dickinson knew about “Peter Parley”; she gives him a mention in her first published poem. Rosemary Mims Fisk. “The Gentle Boy: A Thrice-Told Tale: Two Reviews and a Bibliographical Note.” Resources for American Literary Study 12 #2 (Augumn 1982): 189-194. An early review of Nathaniel Hawthorne’s The Gentle Boy probably was by Goodrich. Lillian B. Gilkes. “Hawthorne, Park Benjamin, and S. G. Goodrich: A Three-Cornered Imbroglio.” Nathaniel Hawthorne Journal 1971: 83-112. Samuel Goodrich. Letters, 1822-1856. Manuscript at Alderman Library, University of Virginia Library, Charlottesville, Virginia. Twelve letters from Goodrich, regarding publishing of the Token, Short Stories for Long Nights, and other works. Bookseller, writer, & publisher, Goodrich was instrumental in the formation of American literature. Online version annotated. Virginia Haviland. “Peter Parley Books and Jacob Abbott’s ‘Rollo’.” In The Travelogue Story Book of the Nineteenth Century. Boston: The Horn Book, Inc., 1950. Wayne Allen Jones. “Hawthorne’s First Published Review.” American Literature 48 (1977): 492-500. Hawthorne’s first review was of Goodrich’s The Outcast and Other Poems; discusses the stormy relationship between the two writers. Alice M. Jordan. “Peter Parley.” The Horn Book Magazine 10 (1934): 96-101. Also in From Rollo to Tom Sawyer, and Other Papers. Boston: The Horn Book, Inc., 1948. Perhaps one of the most-quoted (and most misquoted!) descriptions of the influence of Peter Parley on a generation; it appeared in Martin’s “Conversation Corner,” a column for children which sometimes featured queries from adults looking for the source of memorable poems and stories from their early-19th-century childhoods. An appreciation of the Peter Parley books by an early reader. Eriko Ogihara. “Reconstructing the World: Peter Parley’s Universal History.” MA thesis. University of Tsukuba, 2000. “Peter Parley.” Reward of merit. c1860. A paper originally presented at the American Culture Association meeting, Boston, Massachusetts, April 2007. Goodrich created probably the first “brand name” in American culture. Rita Podell. “Samuel Griswold Goodrich or Peter Parley.” MA thesis. Columbia University, 1939. An analysis emphasizing what he says about American history. In 1852, Peter Parley was nominated for the presidency, as the “Children’s Candidate.” He didn’t win. The Maryland Historical Society owns a flattering portrait of Goodrich by one of a family of marvelous painters; a gray-eyed Goodrich sits in an armchair. Silhouette portrait (26 Oct 1839). Auguste Edouart. The National Portrait Gallery includes two daguerreotypes of Goodrich among its holdings. One daguerreotype evidently is a mirror-image (no pun intended) copy of the other. DAG #217 greatly resembles the engraving sent to subscribers to Robert Merry’s Museum; DAG #166 seems to have provided the original for the carte d’visite of “Peter Parley” available in 1861. In 1851, Goodrich was American consul in Paris; on leaving the consulship, he was presented with a commemorative plaque which was often reproduced. (An image of it was glued to a piece of paper Goodrich autographed for a fan in 1857). This engraving of the medal apparently came from a book published in the 1870s. After Goodrich’s death in 1861, a carte d’visite of “Peter Parley” was published by Matthew Brady. The original of the image evidently was a daguerreotype currently held in the National Portrait Gallery. British writer “Felix Summerly” was one of those distressed by Goodrich’s popular nonfiction (and, perhaps, by Goodrich’s dismissal of fairy tales and Mother Goose rhymes); he declared the style of his own books to be “Anti-Peter-Parleyism.” A reviewer takes Felix to task. Daniel Roselle. Samuel Griswold Goodrich, Creator of Peter Parley. Albany, New York: State University of New York Press, 1968. “Samuel Griswold Goodrich.” American Authors 1600-1900. Ed. Stanley J. Kunitz and Howard Haycraft. NY: H.H. Wilson Company, 1938; pp. 308-09. An appreciation of Goodrich’s work. Memories about Samuel G. Goodrich; with pictures and details not generally reproduced. Goodrich knew—or at least met—almost every major figure in 19th-century literature and American life. NOTE: Sometimes Emily’s facts are a bit garbled; for example, she cites Peter Parley’s Tales of the Sea as Goodrich’s first Parley book, giving it an incorrect date. However, the article is a lively and intimate look at her father. This little piece of nostalgic condescension is a good lesson in the dangers of defective memory: Stevens’ reminiscence of reading Robert Merry’s Museum probably informed Frank Luther Mott’s article on the magazine, which fueled Humphrey Carpenter and Man Prichard’s entry in The Oxford Companion to Children’s Literature …. I’ve annotated the online version of the article, and added links to some of what Stevens mentions.